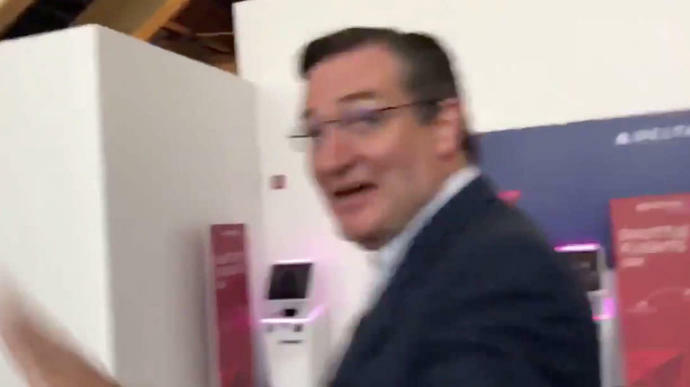 A group of women, who can't be seen in the video (which was tweeted on Monday) can be heard confronting Cruz as he walks through an airport terminal. He told them Kavanaugh's ascension to the court represented a "victory for America." "Putting a sexual assaulter on the court is a victory for women?" one woman can be heard asking him. "So you believe in men assaulting women?" asked another. "I believe in due process," he said, referring to the investigation into the sexual harassment allegations leveled against Kavanaugh. An FBI report - that Senate Democrats criticized for being rushed - wasn't able to corroborate any of the claims. It's not the first time protesters have confronted Cruz. He was heckled out of a Washington, D.C. restaurant last month for the same reason. Kavanaugh's confirmation process grew rocky after Christine Blasey Ford came forward accusing the judge of assaulting her when they were both in high school in the 1980s. Several other women subsequently came forward with stories of their own, though Ford was the only one to testify in front of the Senate Judiciary Committee. Ford's emotional rendering of the alleged encounter wasn't enough to sway Republicans ― all except Sen. Lisa Murkowski (R-Alaska) voted in Kavanaugh's favor. Cruz is in the midst of a battle for his Senate seat against Democratic challenger Beto O'Rourke, though a CNN poll released this week placed Cruz ahead of O'Rourke by seven points.